All Black National Convention | New Growth Hair Magazine | We capture the culture of urban barbershops and beauty salons. On September 28th, Dr. Boyce Watkins launched the 2nd Annual All Black National Convention at Simmons College in Louisville, KY, a 19th century educational institution founded by formerly enslaved Africans who pooled their resources to educate their children. During the 2016 presidential election campaign, Dr. Watkins was inspired to create The All Black National Convention because of the lack of inclusion of issues affecting black folks at The Democratic and Republican National Conventions. On Thursday evening, Dr. Boyce opened the convention with a stock market masterclass. He emphasized the importance of long-term investment strategies to bridge the racial wealth gap. Masterclass students learned how to invest in the stock market with as little as $5 per day. Dr. Boyce believes that more black people need to invest in the stock market so that we can gain financial freedom. Watkins said “We must be willing to finance our freedom”. Investing in the stock market is one way to build wealth and finance our freedom. On Friday, convention goers watched Resurrecting Black Wall Street, a film produced by Dr. Boyce Watkins about the area in Tulsa Oklahoma known as Black Wall Street which was destroyed in 1921 by a race riot. After the film, Za Za Ali delivered a keynote address focused on social warfare against black women followed by a panel discussion with Shaquita Graham, Michelle Martin, Madam Prezident, and Dr. Tyra Sheldon. The panel discussion was a spirted conversation about the state of black women. The conversation covered topics related to sexual responsibility, emotional well-being, relationship issues, parenting, and current events. On Saturday morning, Dr. Boyce hosted a private VIP Meet & Greet. The guests were able to ask Dr. Boyce questions about starting, growing, and marketing their businesses. He shared insights with them about how he started and financed his business, the entrepreneurial struggles that he faced, and the importance of marketing and branding. Dr. Boyce provided guests with interview opportunities and free exposure on his media platforms. During the Saturday afternoon sessions, convention goers screened Generation One: The Search for Black Wealth followed by a panel discussion entitled “The State of Black America Now” with Ryan McCrary, Shareef Abdul-Malik, Rhashad Hicks, and Dr. Shonna Etienne. 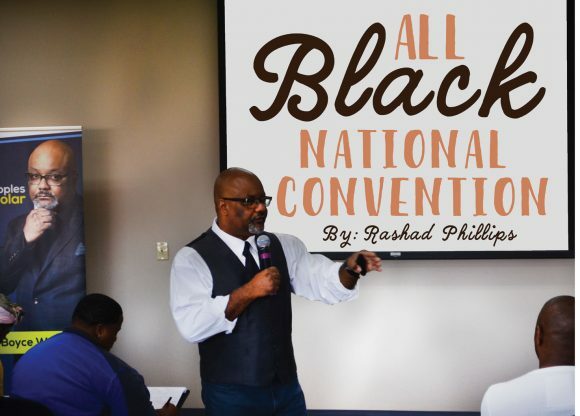 Next year, The All Black National Convention is scheduled to take place in Philadelphia, PA. If you are serious about building wealth, improving your financial situation and; networking with investors and entrepreneurs, make plans to attend next year’s All Black National Convention.